Milo Stutzman: deacon, Bible teacher, minister and evangelist of the Salem Mennonite Church near Tofield, Alberta, was born on 18 January 1886 near Milford, Nebraska, and died at Tofield, Alberta 13 June 1985. 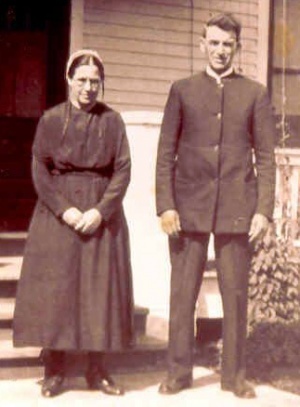 He married Barbara Ellen Birkey (20 December 1886-29 April 1952) on 30 May 1907. They were the parents of 3 daughters and 2 sons. After Barbara died, Milo Stutzman entered a second marriage, this time with Salina Swartzentruber (25 September 1890-2 October 1984), on 2 April 1958. The Stutzmans moved from Nebraska to the Tofield district in 1911, shortly after a new congregation had been organized there. In 1912 and 1913 he served as Sunday School Superintendent in the Salem congregation, and was ordained a deacon in 1913. The next year, on 29 November 1914, he was ordained a minister in the congregation. From 1919 until 1923 Stutzman attended the Bible Academy of Hesston College in Hesston, Kansas. After his return to the Tofield district he made his home on a farm near Kingman while serving the congregation as a minister. He also worked as a teacher, evangelist, singing instructor and conference secretary, and took an active part in the work of the Alberta-Saskatchewan Mennonite Conference. In 1934 he joined C. J. Ramer and Ezra Stauffer to teach in an itinerant Winter Bible School. During World War II he made many trips to the conscientious objector work camps in Alberta. He was always keenly interested in the activities and spiritual welfare of the youth in the congregation and in conference activities. He read widely, took a keen interest in scientific phenomena, and enjoyed considerable mechanical skills which he used innovatively, particularly in the difficult days of the Great Depression of the 1930s. The high regard in which members of the congregation held him was given expression when members nominated him several times for ordination as bishop. But the lot did not fall on him. Undeterred, he continued his work as a teacher, preacher, counselor and evangelist. He was an excellent conversationalist and story-teller whose preaching emphasized Christian discipleship. He believed strongly in historic Anabaptist and Mennonite teachings which emphasized that followers of Jesus must not only believe in him as Savior, but also as Lord over all aspects of their lives. In his later years he was the Grand Old Man of the conference. He died just short of his 100th birthday. Round Hill & District. Salute the Pioneers - available at the Glenbow-Alberta Institute in Calgary. Stauffer, Ezra. History of the Alberta-Saskatchewan Mennonite Conference. Ryley, Alberta: Alberta-Saskatchewan Mennonite Conference, 1960: 103-104. Voegtlin, Paul. "36,300 days." Northwest Conference of the Mennonite Church Newsletter (Summer 1985): 1. Regehr, Ted D. "Stutzman, Milo (1886-1985)." Global Anabaptist Mennonite Encyclopedia Online. December 2003. Web. 19 Apr 2019. http://gameo.org/index.php?title=Stutzman,_Milo_(1886-1985)&oldid=117535. Regehr, Ted D. (December 2003). Stutzman, Milo (1886-1985). Global Anabaptist Mennonite Encyclopedia Online. Retrieved 19 April 2019, from http://gameo.org/index.php?title=Stutzman,_Milo_(1886-1985)&oldid=117535.